Get a feel for the authentic American experience as you \'get your kicks\' exploring historic Route 66. From the mid-west to the Pacific coast you will be able to explore the cosmopolitan cities of Chicago, St. Louis and Los Angeles, as well as iconic places you've heard about in songs and movies such as Amarillo, Tulsa and Santa Fe. Visit the Grand Canyon and enjoy a little of Sin City with a stay in Las Vegas. Keep the camera ready as you\'ll want to take plenty of pics on Route 66! Arrive at Chicago’s O’Hare International Airport and transfer independently to your hotel. Enjoy a day at leisure discovering the Windy City. Stand on the corner of Michigan and Adams, marked as the starting point of historic Route 66. Enjoy coffee and a big breakfast at Lou Mitchell’s, a Chicago institution since 1923 and a must for Route 66 travelers. Stroll the lakefront, peruse the shops, bike the parks, grab a Chicago Dog, or explore the city’s incredible sights and architectural treasures including Willis Tower, North Americas tallest building. Overnight in Chicago. Holiday Inn Downtown or similar. some of the country’s biggest, oldest and most peculiar sites along the way. 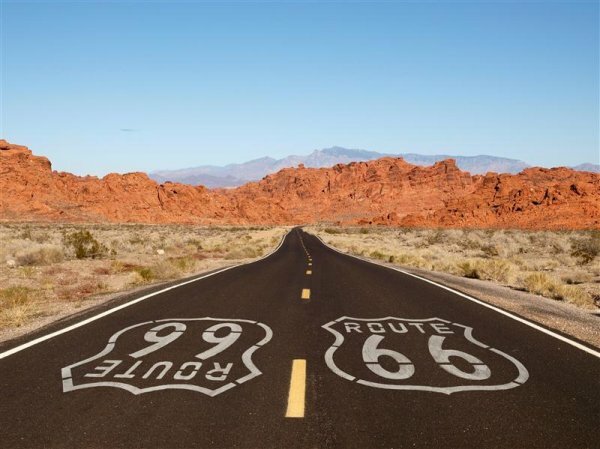 Begin your journey by following the traditional east-to-west path of Route 66 from Chicago to St. Louis, cruising through endless cornfields and flat prairies. 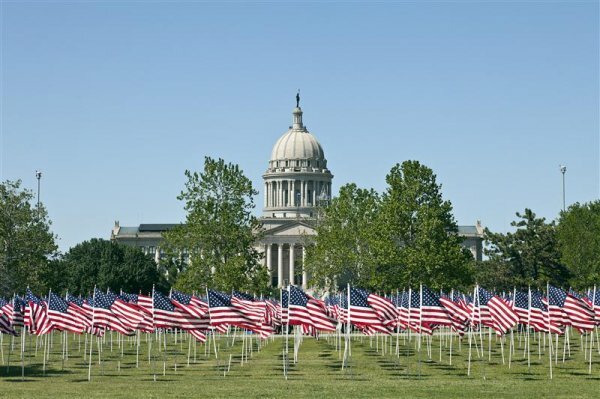 In Springfield, stop at the Cozy Dog Drive-In, the birthplace of the corn dog, and explore the legacy of Abraham Lincoln with a visit to the Lincoln Home National Historic Site. Once in St. Louis, the largest city along Route 66, you can follow in the footsteps of legendary explorers by visiting the historic sites found throughout the city including the Gateway Arch, the nation’s tallest monument. Overnight in St. Louis. Red Roof Plus or similar. Today, continue through the Ozark Highlands of southern Missouri to Springfield, recognized as the birthplace of Route 66 in 1926. En route, be sure to stop at Meramec Caverns, Missouri’s buried treasure located in Stanton. These caverns are an extensive set of natural limestone caves whose formations and colors are as unique as they are beautiful. Jesse James used them as a hideout and took advantage of the underground river to escape through the 'back door'. Overnight in Springfield. Best Western Route 66 or similar. check out the old Route 66 motels, gas stations and numerous vintage buildings. Overnight in Oklahoma City. Howard Johnson Inn or similar. 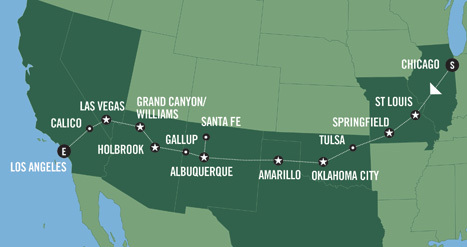 Continue through Oklahoma to Amarillo, located in the pancake-flat plains of the Texas Panhandle. Stop en route at the Route 66 Museum in Clinton where you can experience six decades of Route 66 history, and at Shamrock’s Tower Station and U-Drop Inn Café, whose towering spire is still a reminder of the booming business it once saw. See the first restored Phillips 66 gas station in McLean, and two other eye-catching sights in Groom, the leaning water tower and a giant stainless steel cross that stands 150-feet tall. Overnight in Amarillo. Quality Inn Medical Center or similar. This morning head towards the MidPoint Café in Adrian, ideally located at the halfway point of Route66 and famous for its “ugly crust” pies. From Adrian you’ll follow Route 66 to Albuquerque, New Mexico for a great taste of the Land of Enchantment. Overnight in Albuquerque. Best Western Plus Rio Grande Inn or similar. Enjoy a day at leisure. Spend the day exploring Downtown Albuquerque’s Central Avenue, a treasure trove of Route 66 landmarks and one of the original Route 66 towns. 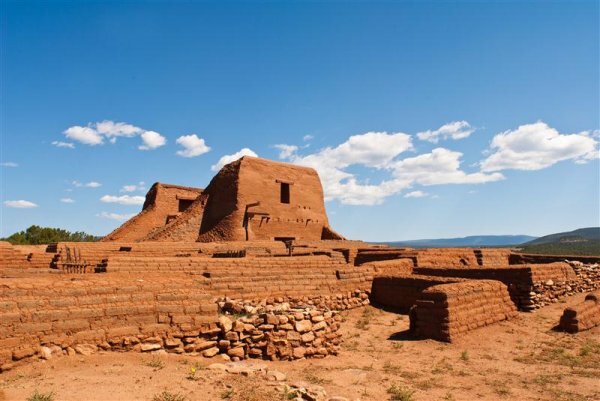 Historic Old Town offers a taste of New Mexico’s Spanish colonial past while the Indian Pueblo Cultural Center, owned by the state’s 19 different Pueblo communities, traces the history of the region’s Native American cultures. lost its place on Route 66 in 1938, it remains one of the most picturesque cities in the state. This morning view huge concrete tepees that stand at the foot of brilliant red-rock mesas en route to Petrified Forest National Park, the only park in the National Park System containing a section of Historic Route 66. Catch a sunset over the Painted Desert from the park’s Kachina Point before heading to Holbrook. Once in Holbrook, stop at the Wigwam Motel whose steel and concrete teepees featuring modern conveniences have welcomed guests since the 1950’s. Overnight in Holbrook. Magnuson Adobe Inn or similar. Continue to Meteor City, a true vintage trading post whose distinctive dome can be seen for miles along this stretch of Route 66. Pass through Flagstaff and Williams en route to Grand Canyon National park. Spend the day discovering the distinct South Rim of the Canyon. Stop at one of the numerous overlooks, walk part of the Rim Trail or along the historic Hermit Road. Overnight in Williams. Ramada Williams or similar. Leave the pretty town of Williams and the Grand Canyon behind as you make your way to Seligman, the first stop heading west on the longest uninterrupted stretch of Route 66. Continue through Kingman whose old Route 66 cafés and motels still flourish, to Hoover Dam. Considered the largest single public works project in the history of the U.S. Continue to Las Vegas, Nevada, a city that needs no introduction. Overnight in Las Vegas. Excalibur Hotel or similar. boutiques or ride a rollercoaster. Santa Monica. Park and venture the last few blocks on foot to view the “End of the Trail” sign on Santa Monica’s Pier. This sign officially marks the western end of historic Route 66. Overnight in Los Angeles. Quality Inn and Suites Anaheim or similar. Welcome kit with comprehensive maps and day-to-day itinerary. Exclusive 10% discount on purchases at Macy’s stores. Enjoy a day at leisure. 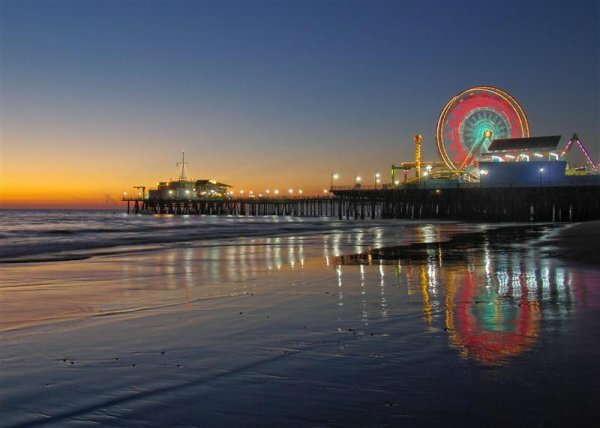 Spend the morning strolling along the beaches of Santa Monica or browsing the shops at Third Street Promenade. You may wish to spend the day at Universal Studios Hollywood or Anaheim’s original Disneyland Park. Tour ends. Return your rental car at Los Angeles International Airport prior to your departure.